When I was growing up, I was always told by my father to disconnect all the outdoor hoses and wrap them up. I never understood why this was so important, but after seeing several hose bibs burst, which Fox Plumbing & Heating had replaced, it makes perfect sense. Especially here in the North West if you live in Seattle, Bellevue, Kent or anywhere else in King County. 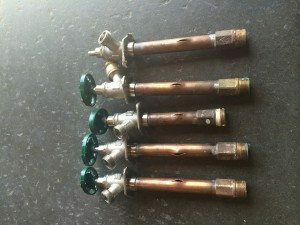 Your Neighborhood Plumbing Professional from Fox Plumbing & Heating is here to explain why this happens, and how you can save several hundreds of dollars every year by simply disconnecting your hose from the hose bib to allow water to drain in the winter. You can avoid yearly costly repairs by taking one easy step: disconnect the hoses form your spigot. This enables your frost free hose bib to drain the excess water that sits in the hose bib and keep it from freezing. If you don’t, the next spring when you turn on your spigot it can burst and cause flooding in the wall. This can cause thousands of dollars in damage to your home. In the pictures you can clearly see how a hose bib is supposed to look, and how they split when the water freezes inside the copper piping, expanding then splitting the pipe. When spring comes around, you may not even notice the leaking from the burst. Because some of these leaks are small between the outer and inner wall the damage can easily go unnoticed. You may not ever even notice a difference in water pressure, but the burst will continue to leak. Damaging walls and possibly floors and you won’t be aware of this until it’s too late. 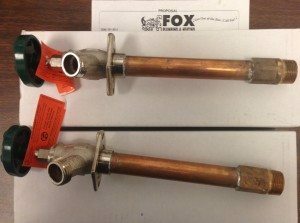 The Fox Plumbing & Heating team has done hundreds of these replacements every year for home owners from Kent to Seattle and all over King County. The average cost of these jobs range from $200 to $600 dollars, and that doesn’t include the damage to wall and/or floors. That’s money that can be saved by simply taking a few moments to disconnect your hoses in the winter. Also, remember to wrap your hoses and store them properly, this ensures the life of your garden hose. Your Neighborhood Plumbing Professionals at Fox Plumbing & Heating are always ready to help answer any questions that you might have to prevent costly repairs. If you have any questions or topics you’d like us to cover, please leave us a note in the comments and we’ll do our best to cover it in a future post. The Right Professional Contractor for the Job!